Man’s best friend. A furry companion. Snugly, loving, caring, loyal and the list goes on and on to describe how important a dog can be to a family. Jacobe Martin had his best friend in the form of his dog Belle up until recently when Belle was tragically lost while the family was out of town. 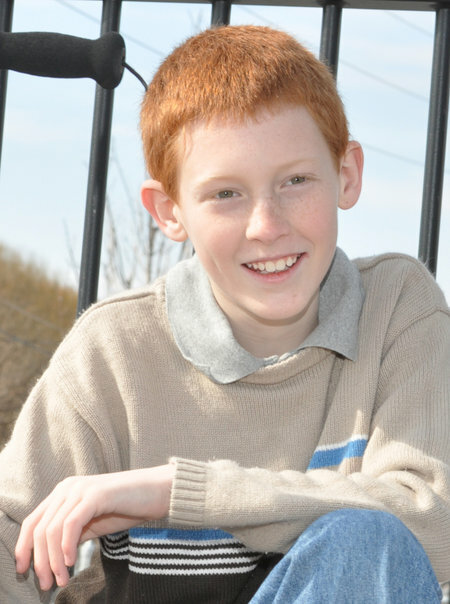 Devastation does not even begin to describe feelings of loss for 14-year-old Jacobe upon hearing this news. Belle was 8-years-old and stood by Jacobe’s side to comfort him no matter what. After losing his best friend, Jacobe Martin believed that nobody cared about him. Upper Deck worked with his family to prove him wrong while creating a memorable way immortalizing his dog Belle. After the passing of Belle, Jacobe was not taking the loss well and felt that no one truly cared about him. This was heartbreaking for his family to hear and they knew something had to be done. In a letter written to Mackenzie Dodge of KEKB 99.9 Colorado, it explained that Jacobe did not make friends easily and now that Belle was gone he just felt terribly alone. Mackenzie Dodge was touched by the story and moved to let Jacobe know just how much people do care about him. Jacobe’s address was posted and people were encouraged to write letters to him letting them know that people are thinking of him and that he will always matter. Within the same day of the story being posted, news had already traveled all the way to North Carolina and Jacobe’s PO Box was about to be flooded. 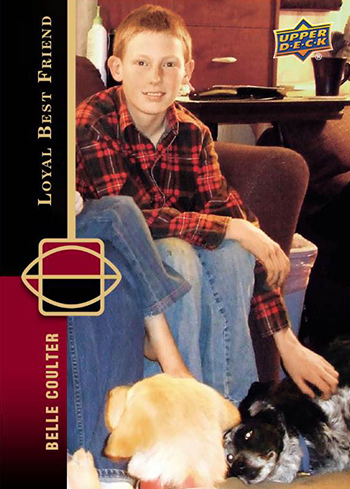 Shortly after the story was online Upper Deck received a note from Dan Coulter (Jacobe’s father) asking if there was a possibility to create a trading card in memory of Belle. We loved the idea as it matched perfectly with our ongoing Random Acts of Kindness program where we look online to help worthy fans and create some feel good stories to promote everything good about the hobby. We jumped at the opportunity to help create something special for Jacobe to remember Belle by and for him to share with his family and friends. Not to mention, it’s pretty exciting to appear on an Upper Deck card before you’ve made the pros! 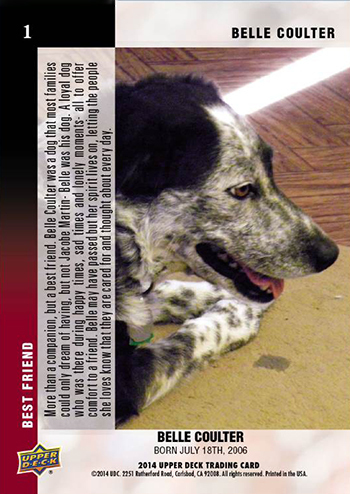 Our goal primarily was to lift Jacobe’s spirits however and we hope the trading card we created in loving memory of Belle does just that. Upper Deck is producing a short run of these special cards to share with Jacobe and his family. This is the card back for the special Jacobe & Belle card from Upper Deck. Dan plans on sharing the cards with Jacobe when they finish production next week. It will be nice for the family to bond over the experience and the card, because in their simplest form that is what trading cards are all about, bringing families closer together. And every time Jacobe looks at his card with Belle, we hope he smiles with confidence knowing just how much we all care about him. So good to see a national business doing good on a local level!